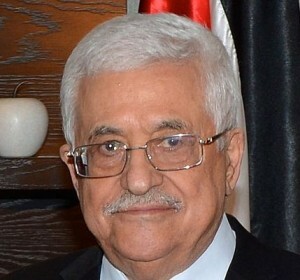 Palestinian Authority President Mahmoud Abbas. Israeli Prime Minister Benjamin Netanyahu publicly invited Abbas to return to the negotiating table. Photo: Wikipedia. JNS.org – The Israeli Prime Minister’s Office on Thursday denied claims by Palestinian Authority (PA) President Mahmoud Abbas that the Palestinian leader had recently sought a meeting with Prime Minister Benjamin Netanyahu, but was ignored. “This is another attempt by Abu Mazen (Abbas) to shirk responsibility for the stalled peace negotiations. In Davos as well, Netanyahu has urged Abu Mazen to resume talks without preconditions,” one official said, Israel Hayom reported. On Thursday, Netanyahu, who was participating in the World Economic Forum in Davos, Switzerland, publicly invited Abbas to return to the negotiating table. The Prime Minister’s Office issued the clarification after a press conference held by Abbas in Ramallah on Thursday morning. Abbas had told Israeli reporters that his office had recently reached out to the Prime Minister’s Office to set up a meeting with Netanyahu and reignite the Israeli-Palestinian peace process. According to Abbas, the overture was ignored. “I agreed to meet with Netanyahu but his people never got back to us,” Abbas said.